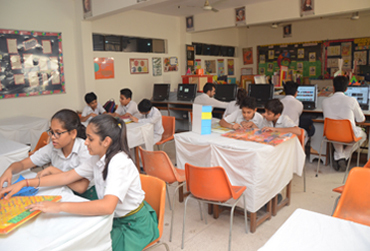 Maths laboratory project in Bhatnagar International School is not a new concept. The active department of mathematics always provided an environment to supplement classroom teaching by innovative teaching methods. Revolutionary step in teaching- learning Mathematics through COMPUTERS was taken up decade back. Formally the laboratory project was set up in 2002. Since then, Maths Lab has become mainstream of the curriculum. Presently the Maths Lab is compulsory part of Maths Teaching —Learning Process. The school plans the annual schedule for the Lab Activities for classes 2 to 11th. The annual schedule is given to the students in the beginning of the academic session. All activities are thoughtfully planned by the teachers to reduce the abstractness of the subject and to relate mathematics to real life. Pre planned experiment and activity is performed under the guidance of the teacher. Conversion tools---metric tool, 1cm and hcf tool, percent-decimal conversion number system etc. Brain pop, mathematica, sketch pad graphic calculator animation films on trigonometric functions etc. Reference material for teachers provide new possibilities of teaching. Multimedia teaching itself generates keen interest in students. C.Ds. are shown on projector in multimedia room of the school on regular basis.